I met a Cadillac STS owner from Germany on a Cadillac Facebook group and he makes all sorts of things like this. He came to NY in December and brought this gift for me. A very nice thing to do. It has selectable color LEDs, dimming, cycles colors, pulses, and a remote. Very cool thing! Good for the office, desk, night light and man cave. I posted this quickly and will post his contact info asap. Very nice. Is he doing them for sale? Well I spoke to André and while I thought he intended to sell these I was unfortunately mistaken. This is a very cool cadillac memento that I plan to display prominently in my man cave. 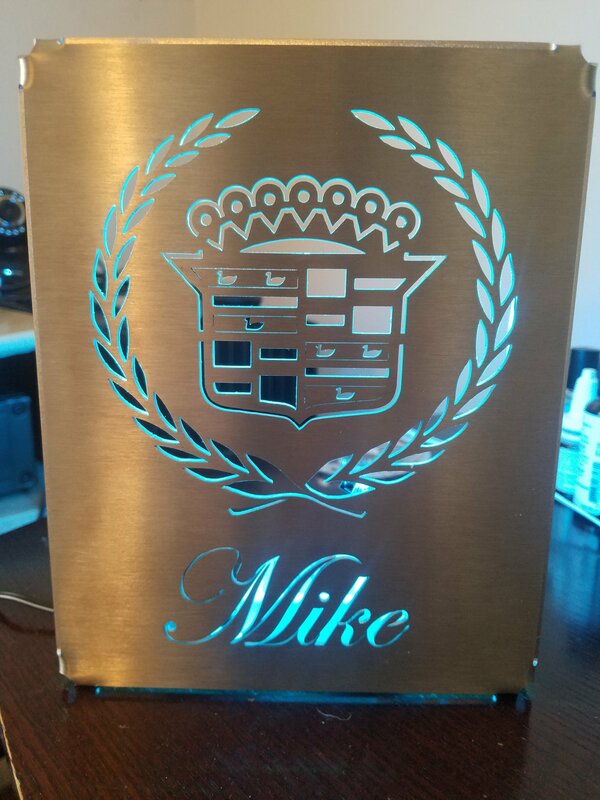 I love custom stuff like that, and it is so great to have access to equipment at work to make things like that for my cars or for friends. The 3D-printer machines and laser-cutting is so cool! I'm in the process of designing and building a set custom 3D lug cover/centercap for my son's Audi. The generic one that came with his new rims just don't do the A6 justice. '09 Cadillac CTS 3.6 direct injection, 103 K mi. '70 Firebird Formula 400, Bored+.04, RAIII heads, M21 4spd., in-process restoration!